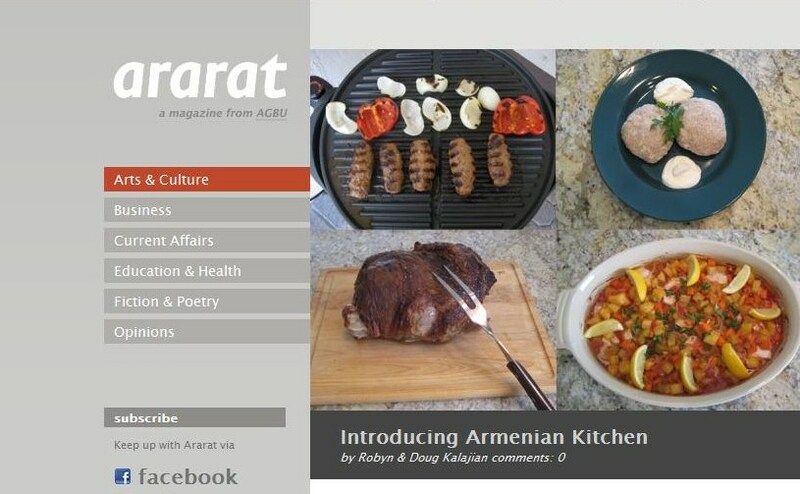 TheArmenianKitchen.com : Virtual Ararat: On to greater heights! We're thrilled to be part of the new online incarnation of the AGBU's respected magazine Ararat. Ararat (http://www.araratmagazine.org/) has a long, proud tradition of outstanding literary, cultural and opinion offerings -- so it's very cool and a bit humbling to find ourselves contributing a monthly food column. Personal aside from Doug: I started in journalism way, way back in the day of manual typewriters and lead type. For old newspaper guys like me, the digital revolution has been jarring; it's a big part of why my old newsroom job no longer exists. But it's by far the most exciting development in communication since the telephone -- maybe since the alphabet. For me, the astounding reach of this blog to thousands of readers in all corners of the globe is just a hint of the Web's potential to deliver ideas and information to more people in more places than anyone could have dreamed possible just a few years ago. It's exciting to see Armenian culture lifted and carried around the world in this way as more and more of our traditional publications begin to explore and exploit the Internet's extraordinary capabilities. We wish all the best to Ararat editor Aris Sevag and the entire Ararat staff!